The final rule also include provisions not only to encourage workers to report their injuries and illnesses but also to protect workers from abusive employers who may use threats to discourage workers from reporting their injuries or retaliate against those who did. Employers are legally required to inform their employees of their right to report work-related injuries and illnesses free from retaliation. 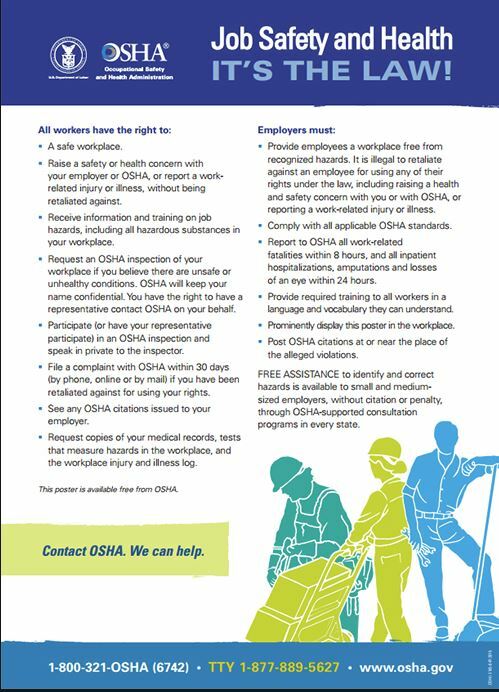 This can be done by posting the OSHA “Job Safety and Health, Its the Law poster” (Click on the image for full size) where all workers can see it. Construction industry groups criticized the new rule. They were especially upset about sharing their data and about what they called the anti-retaliation provision. After the rule was announced last January a lawsuit filed by he National Association of Home Builders — along with the U.S. Chamber of Commerce, the Oklahoma State Home builders Association, the State Chamber of Oklahoma and three poultry associations resulted in a delay of the implementation of the final rule to August 1st. The implementation of the retaliation provision was delayed to November 1st and then further delayed to December 1st by a legal challenge in a Texas court. A motion from construction and manufacturing industry groups requesting an injunction against implementation of the “anti-retaliation was then denied by a federal judge in Texas.